Finisterre, "The end of Land" it is also known as "The End of the Coast of Death"
Its name came from the latin language "Finis Terrae" The ancient Romans believed that here, the land finished and the sea began. 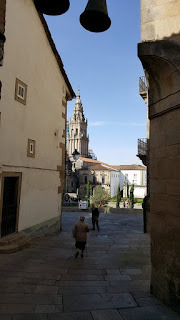 Many piligrims arriving to Santiago de Compostella, end their journey in Finisterre. There are many legends about Finisterre and the relationship between the piligrimage routes in Spain and coming from all over Europe, to Finisterre. It is all connected to the Apostol Santiago, believed that his body was transferred to this land, by his disciples. 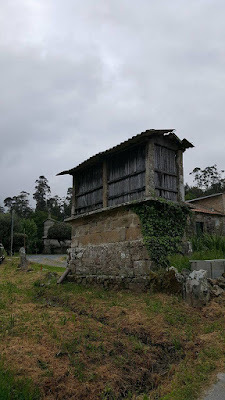 It is also believed that the piligrimage from Santiago to Finisterre is a pagan piligrimage and the piligrimage from Santiago to Muxia (60 km north of Finisterre), a Christian piligrimage. The legends say that the Virgin of La Barca appeard to Santiago (St James) in Muxia, giving him direction and guidence. 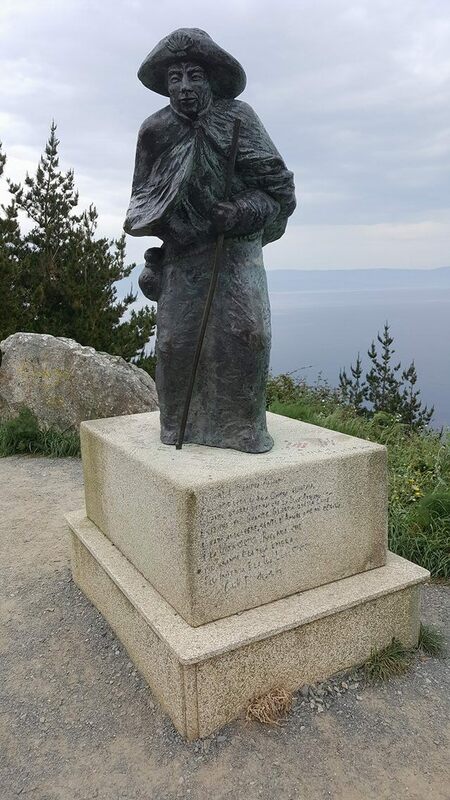 The Cape of Finisterre is 3 km past the village. Very steep, high cliffs above the sea, where the wind is blowing very strong. I see and feel the many places where pilgrims have sat and as a symbol of purification and of a new start, have burnt their clothes and left some tokens or messages to be taken by the wind. The sunset, has been described by many, as incredibly beautiful. The skies today will not share it with me, and as many paradoxes in life, it is not really necessary for me to see it today. "Ara Solis" The Altar to the Sun adoration, where the sea devours the sun in the end of land. The Phoenicians and Caldeans, who name it "Ara Solis" built this Altar in the honour of the King Star. The legends also says, that the Apostol Santiago, ordered to destroy this Altar, because it was a pagan cult. 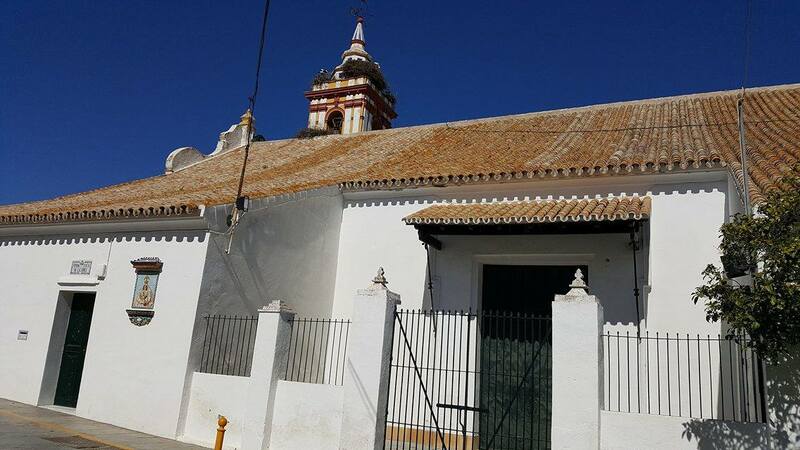 Although, other legends say, that in Christiane times, the "Ara Solis" became the Hermitage of San Guillermo. 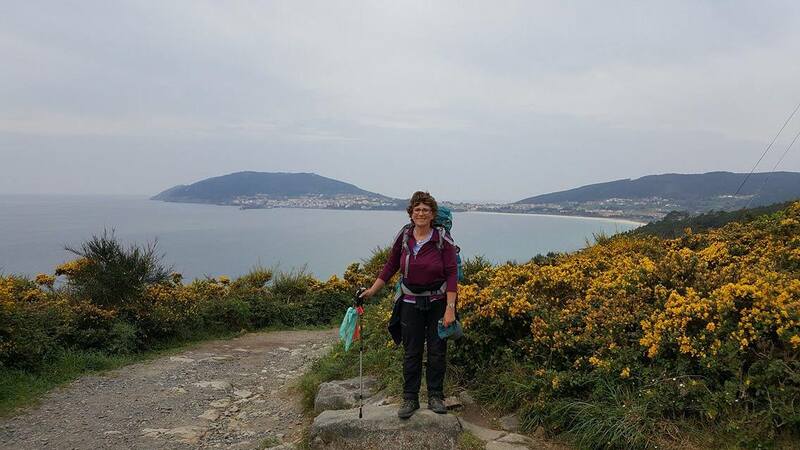 For me, walking and arriving in Finisterre was very special. In my past 2 pilgrimages, I did not have the time to walk this route, because of not enough time. This time would be the right moment for me to complete it. Very rewarding moment. Now my piligramage that started March 6, will be complete. 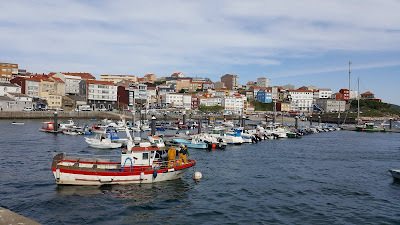 The albergue is very near to the port. In the afternoon I see the sailors and fishermen arriving in their colourful small boats, bringing in their catch. Octopus, hake, monk, lobstairs, crabs and many other fish that I have not seen before. In a small wooden chair sitting sourrounded by their nets, the fisherman fix their nets and prepare them, for tomorrow. Walking by in green and black gum boots, carrying heavy plastic containers with crushed ice mixed with the fish. They are going to the afternoon fish market, where the auctioneers will get the best price for them. We enjoyed a delicious plate of octopus in garlic sauce and a casselore of monk fish with prawns. Albariño wine and delicious brown bread. The dessert was the best chocolate almond flan, that I have ever had. Today, seeing the sea, the atlantic sea, was very special to me. A moment of fully realizing the distance that I had covered. A great feeling of completion. Walking today, took me to many of my walking moments of the camino. 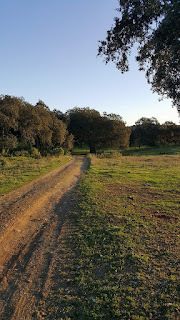 My first day of walking, from Sevilla to Guillena. Leaving Sevilla early in the morning, crossing a neighbourhood of gypsy families. Seeing this one family riding in a wooden chariot, pulled by a horse and waving at me, as I passed by. It had been raining the previous days in Sevilla before I left, some creek crossings were very difficult or not passable. Specially one in particular, that later I heard very funny stories of how other piligrims had crossed it !! 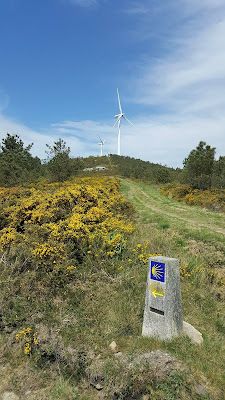 At the point of making the decission, I met two German men, that were walking the camino to study bird migrations, and they chose the extra 8 km walk. I then also decided to do the same. 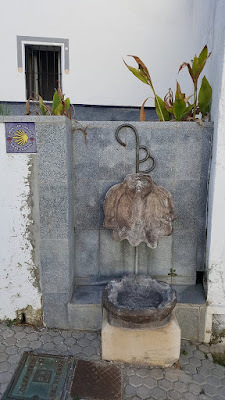 That first day of walking was so long for me, in the hot sun, that when I arrived in the albergue, I lay in my bed and did nothing else than rest. All those moments are now camino memories for me, that I will not forget. And now....here I am in Cee, 1080 km further, by the sea, eating a fish caserole and eating chocolate ice cream for dessert. 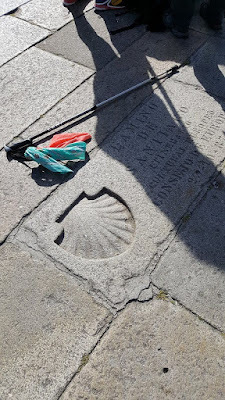 At the start of the camino, it took me three days before I started writting about my journey, as when I would reach the albergues I was too tired and rested instead. 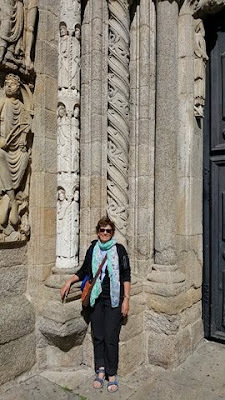 Now I am very happy that I started writting and very thankful to Mary from Victoria, who suggested and offered to start a Via de la Plata blog, with my writings and pictures. for information to other piligrims. My blog naimawalking@blogspot.com is also a great memory for me to have, of this journey that I had not imagined to be so incredible, beautiful and important in my life. Thank you so much Mary. !! Between Negreira and Cee, the villages are very small. Some have a restaurant/bar and an albergue. There are no grocery stores to buy fruit or food along the way, until reaching Cee tomorrow. Cee is the first village by the sea. Santa Madriña has a nice simple albergue and a little restaurant owned by the same family. 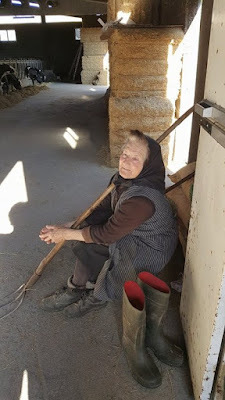 Pepa tells me, that both her husband and her, did not have work, and decided to renovate their house and create an albergue. They have a 10 year old daugther, she is the only child in this very small village, shared by seven families. The Galician idea of what it is flat or steep, is very different than mine. A woman tells me that from one point on, the path was going to be flat. 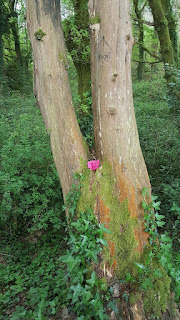 As I start walking it, it climbs and climbs, not too steep but definitely up. My legs are well used to the up and downs, and sometimes it feels that they are walking by themselves. 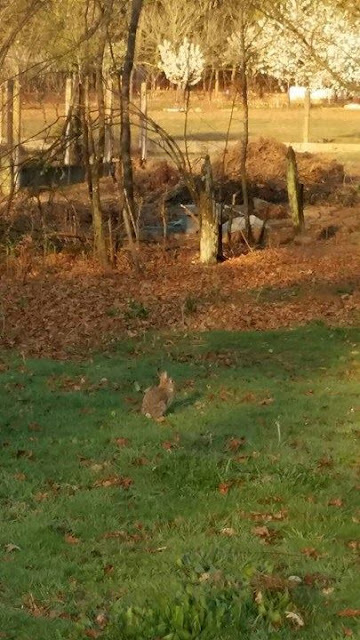 My friend is doing well adjusting to the walking and he is really enjoying the Way. 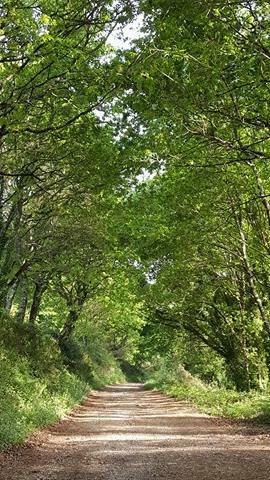 The trail today, to this very small village of Hospital, was beautiful. Large windmills that were in the far distance yesterday, are now just next to us. The sound and wind that they create, very impresive. Many of the ridges that we pass by or see in the distances, have windmills, that have become part of the landscape. Some people don't like to see them, but I feel that they are such a good optional way of creating energy, that it is good that they are here. At the highest point of the trail we can see a "ria" a waterway that comes from the sea, into the inland, as a river. The albergue in Hospital is very quiet and comfortable. Next to us there is a large barn with many cows eating, as we pass by. Sharing the night with us there is a woman from Germany, a man from Denmark and a Spanish family of four. We are all walking similar distances and connecting in the same albergues at night. Tomorrow we have an easy 16 km to Cee, where we will stay. It will be my first time, since a longtime, soaking my feet in the Atlantic salty water and really looking forward to the fresh seafood. 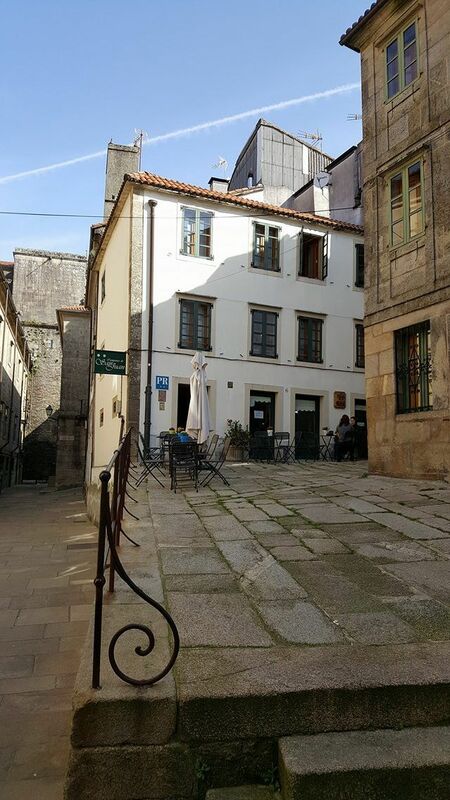 Cee will be our last albergue before Finisterra. 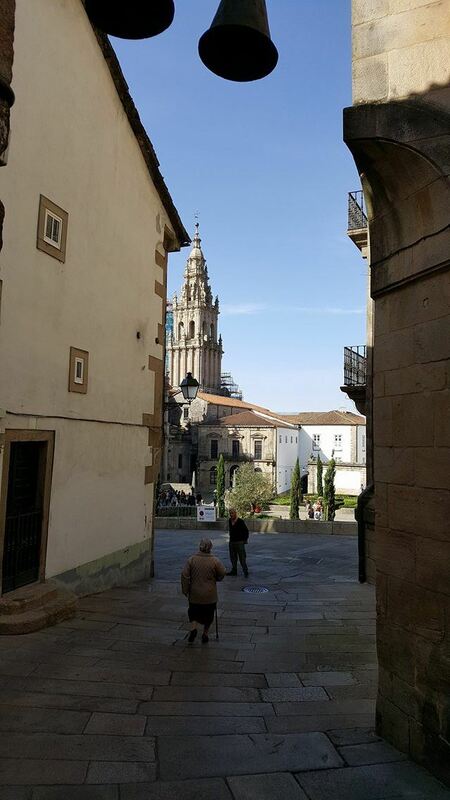 The start of the camino to Finisterre is at the cathedral of Santiago, passing by the "Parador de los Reyes Catolicos" This Parador was the original hospital for the piligrims that were in need of care and attention, when they arrived in Santiago. 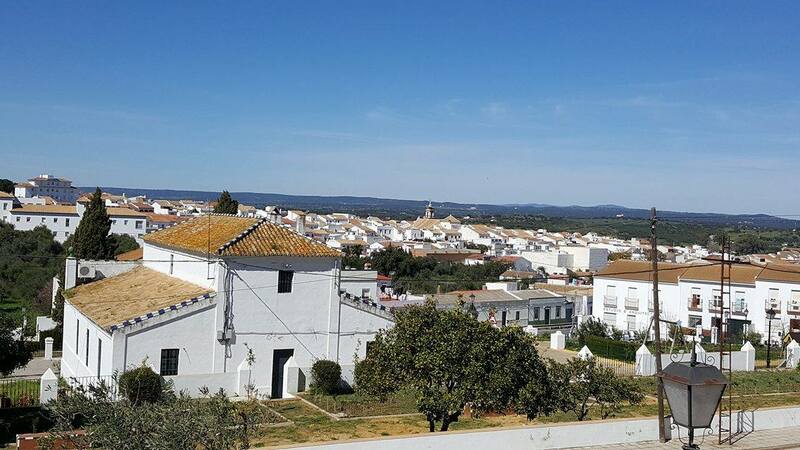 Throughout Spain, historical sites have become paradores, a higher category than hotels. 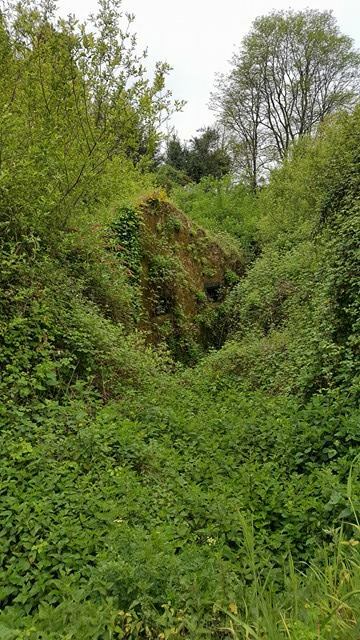 To my surprise, in less than 20 minutes we are leaving the city, by walking a beautiful park with ancient oak tress and soon we are walking in the country side. Today is Easter Friday, we share the path with families and bicycles, that are enjoying this holliday. 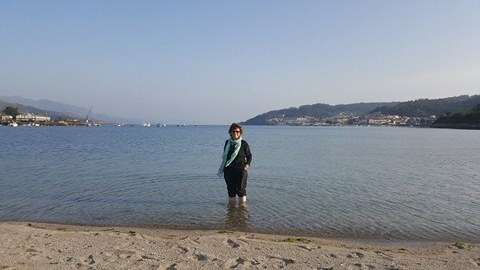 Galicia, has lots of water every where. The vegetation is dense with many shades of greens. 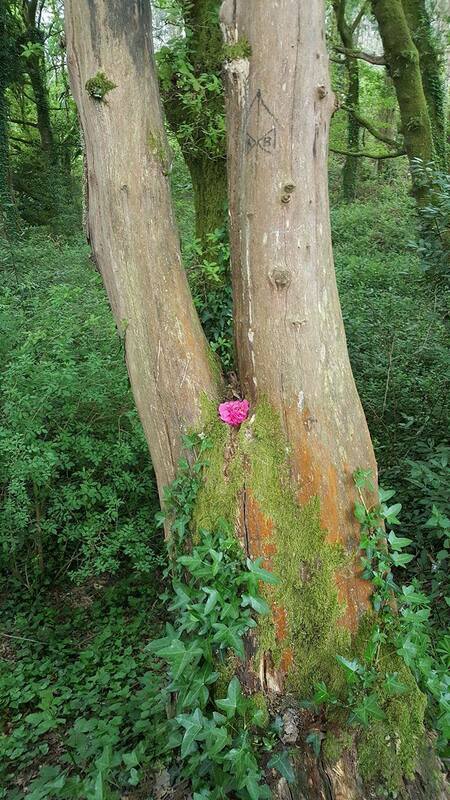 We passed by abandoned houses that are now overgrown by ferns and old rhodedendrum shrubs, now in full bloom. The path is well marked in both directions. Going from Santiago to Finisterre and also in reverse, with a variation to the yellow arrows. 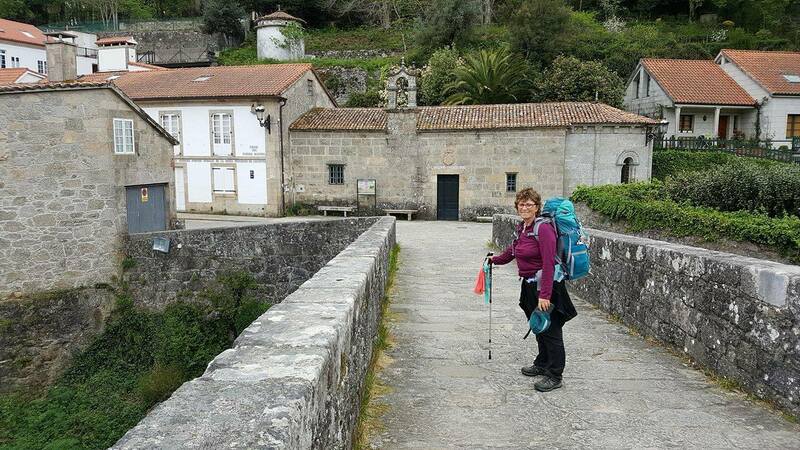 Some piligrims walk this circuit, continuing from Finisterre to Muxia and back to Santiago. 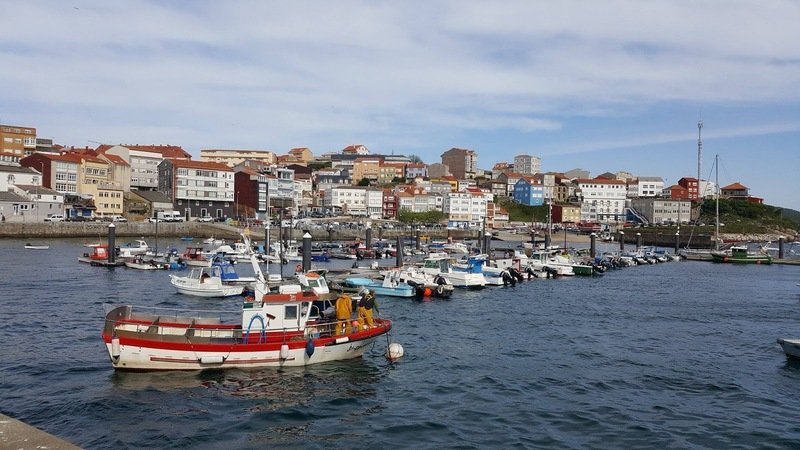 In my past piligramages, I did not have the time to walk to Finisterre or Muxia, and I visited Finisterre, by taking a bus there. I am pleased now to be walking the path to Finisterre, that it was believed to be the end of Earth, as its name indicates. Along the way, we passed a beautiful waterfall, small river and a natural landscape of big rocks and waterways. A stone Roman origin bridge, crosses the river that ends facing a small chapel. 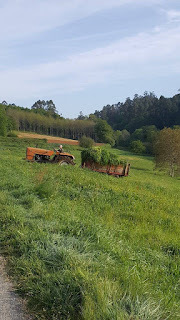 The land is being cultivated everywhere, fertilized by the manure collected from the barns. Cows and horses are grazing. 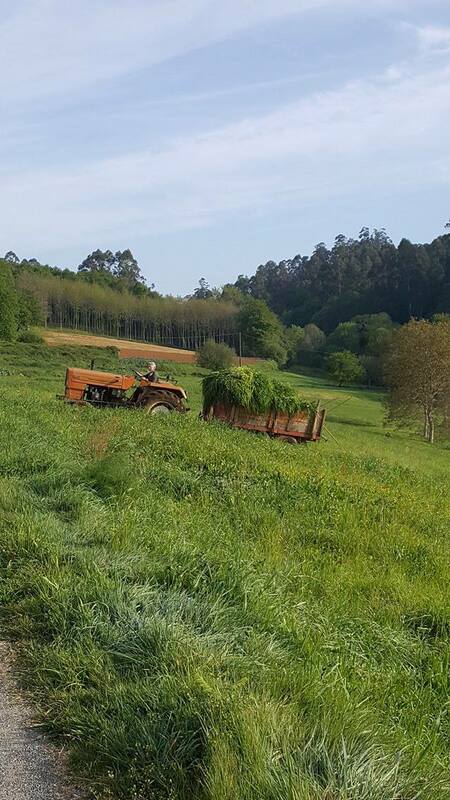 The scent of farm land and country living, accompanies us, as we walk this beautiful path, that follows the slopes. Negreira is our destination tonight, 20 km from Santiago. A basic village with delicious food in the restaurant next to the albergue, where we stayed. Santiago is fully alive !! Many people are in the streets. 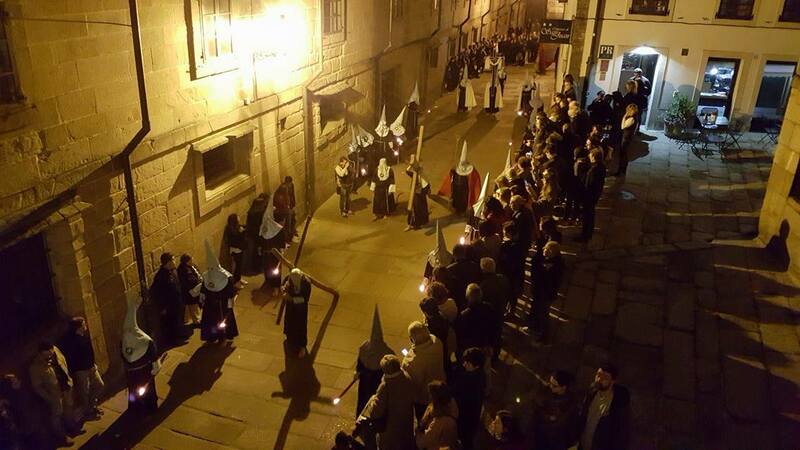 Easter in Santiago, a destination for many Spanish families and Spanish piligrims that have a few days to walk or continue their pilgrimages. I booked a little pension very close to the cathedral, in a street called "Las Campañas de San Juan " The Bells of Saint John" every hour and every half an hour, the cathedral bells were ringing, until midnight and starting at 7 am again. The room is very small and has a tiny bathtub.The wooden bedframe reminds me of being in an impressionist painting. 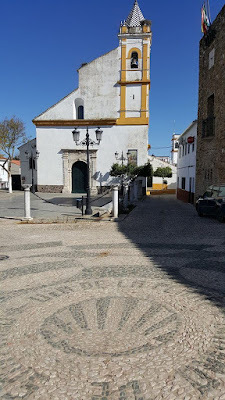 There is a small window facing the little street. At midnight we woke up to a great surprise! The sound of drums. Opened the window. 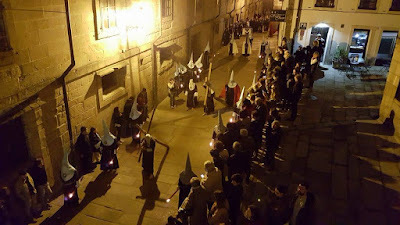 Going by our 5 m wide street, there is a midnight Easter procession. Iluminated by their candle light the "Nazarenos" walking one by one, to the sounds of the walking sticks, firmly in harmony touching the ground. Some Nazarenos are carrying a large wooden crosses in their shoulders, bare feet with chains attaching their feet together. Their heads are covered, to be kept anonymous, maybe from a promise or praying for a specific cause. The street around the little square is filled with people, old and young admiring the devotees' promises. As the procession ends, the people around all join in and follow walking behind, many with the candle light in their hand. Yesterday afternoon in Santiago was exciting. The cafes were filled with delicious tapas and wines. 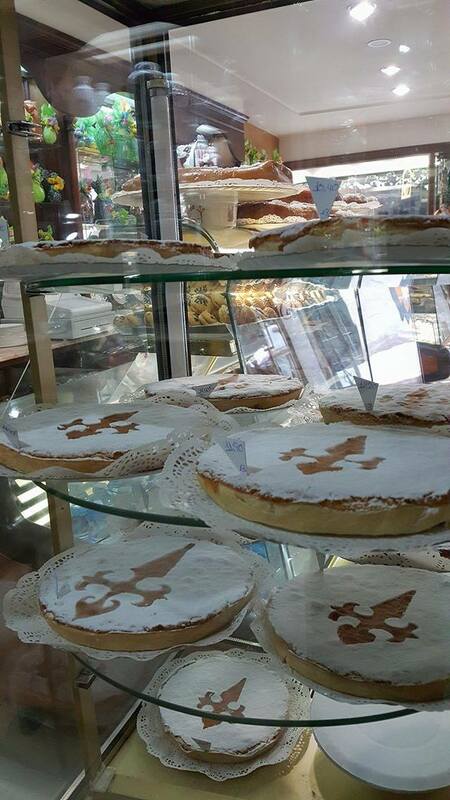 The pastry shops with colourful cakes and chocolates, that tempted my tasting. 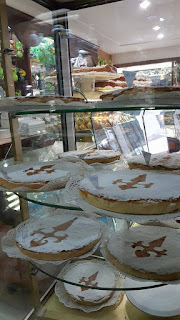 The Santiago almond tarts every where. I went to the piligrims office to ask for a Finisterre and Muxia route map, as I had not planned to be walking this route and was unprepared. I ate at Manolo's, a piligrims menu for 9€ that was large enough for feeding three piligrims. After the procession, the street becomes very empty and quiet. 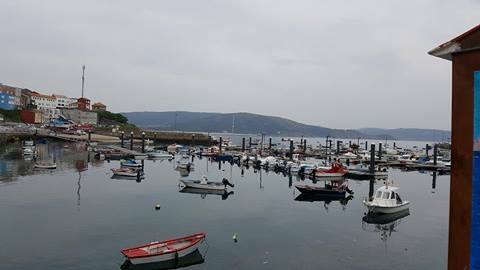 We fell asleep awaiting for this next camino to Finisterre to start tomorrow morning. HAPPY EASTER!!!!! 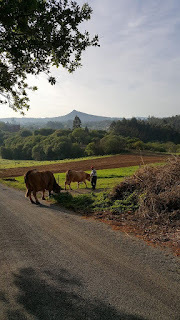 from the Camino! 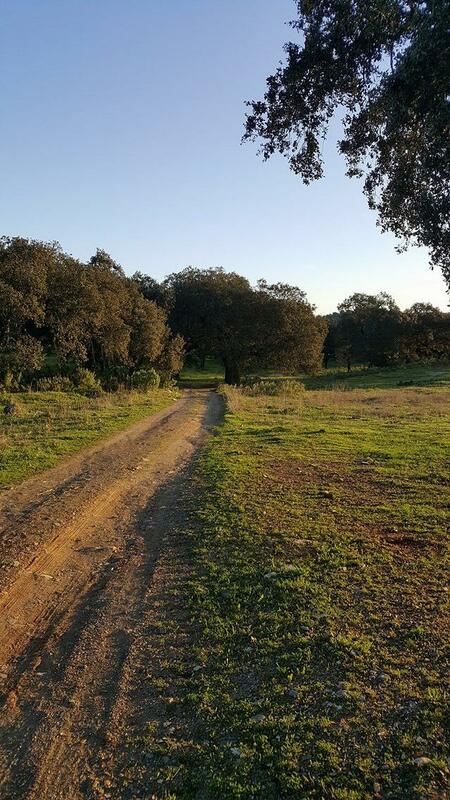 We each create our own camino. The camino has a different meaning for each one of us. 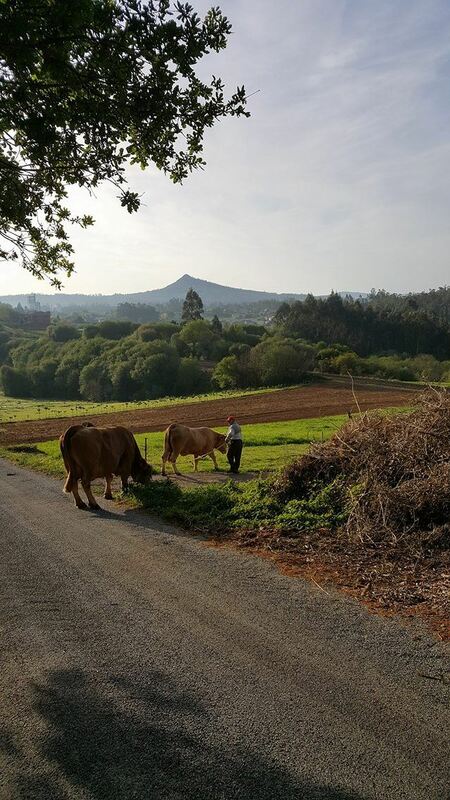 As in everyday life, we adapt and accept, the camino changes. 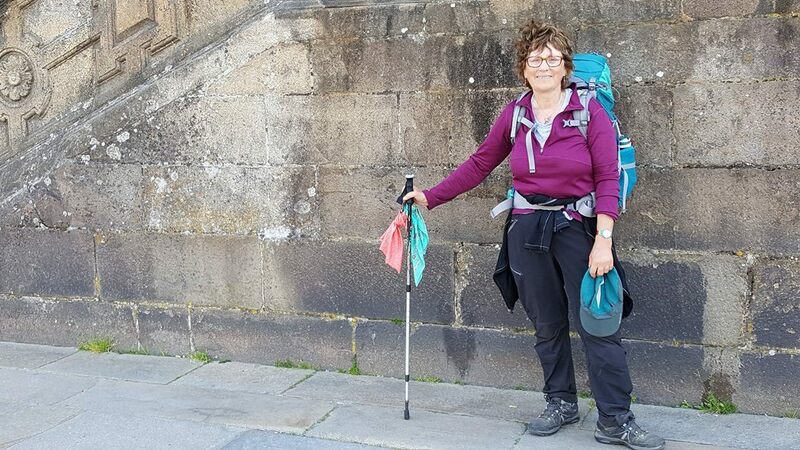 Yesterday, I was 75 km from Santiago, and needed to be in Santiago today Thursday, to meet with a friend, who will be walking 100 km of this piligramage with me. I made the decision to take a bus to the last walking stage to Santiago. 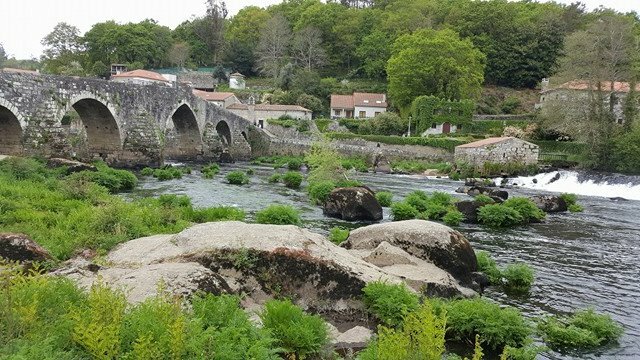 I would sleep in the albergue, and this morning walk the last 17 km to Santiago, in silence. This would complete my Via de la Plata. 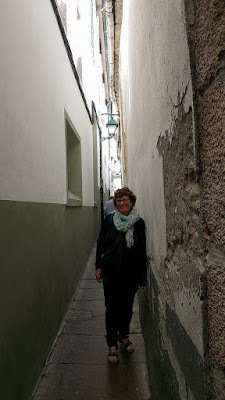 This morning I left the albergue at 6:30 am (as we had to be out of the albergue by 7 am) and started walking. My senses were alert. When the moon was behind the trees or a hill, my head lamp guided me. As the day light was appearing, everything felt alive. I could hear the early morning birds and the freshness in my cheeks. 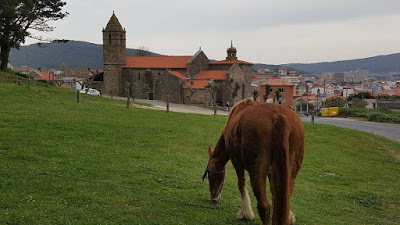 As every other day, when walking in Sanabria, the route always climbing up and down. I crossed a farmer taking his cows to the field. A woman cutting and loading fresh grass for her animals. The dogs barked, when I was walking too close to their fence. It was all magical. A feeling of completion, fulfilment. I am happy to have made this decission of completing my VDLP camino alone, as this was my camino. 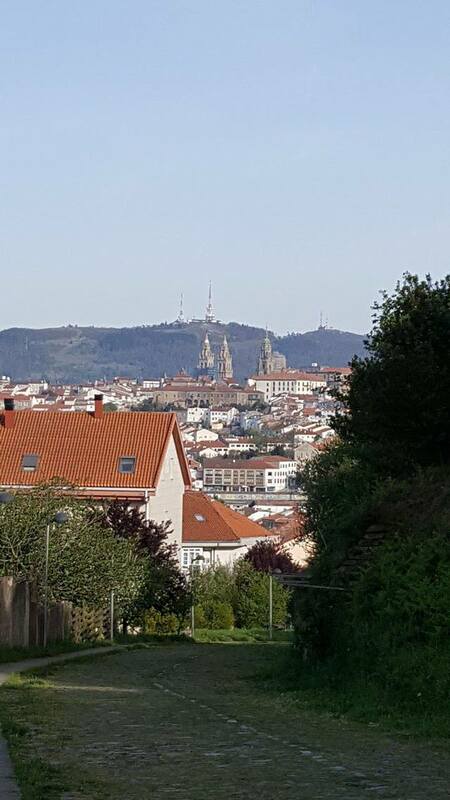 In the distance I saw the cathedral towers of Compostela. I felt complete. Incredible to be here, a moment that I imagined many times as I walked. 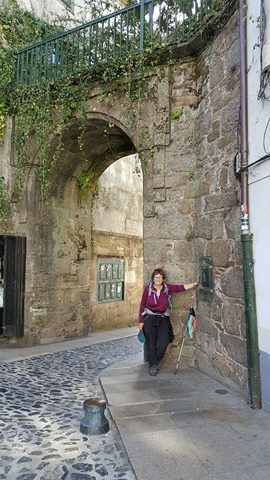 I entered Santiago by a small medieval arch, on the top of a steep street. There is only one entrance arch into the city remaining of this fortress that once protected the old city of Santiago. A man was walking by and I asked him if he could take my picture by the arch. He is a history teacher and very pleased to take my foto for me and also to tell me the history of the arch and sourrounding buildings. He accompanies me through the small streets giving me a history lesson. Takes me to a beautiful food market, that today, Thursday, is fully alive. The stalls are very busy selling fish, meats and vegetables. All around the market there are also the local farmers that bring their fresh chesses, eggs, milk, flowers, herbs...they have a small little chair and an umbrella to protect themselves from the sun. A copper scale, with shinny weights by them. I really thanked him when he leaves, for the great improvised tour that he gave me. The narrow streets take me to the cathedral of Santiago. Tourists, families and piligrims are all around. I sit, feel and admire this moment, sourrounded by this beautiful cathedral. I am very grateful for this journey. Thankful to life, for giving me the opportunity to walk the Via de la Plata. I am thankful for my health, my family, my friends. 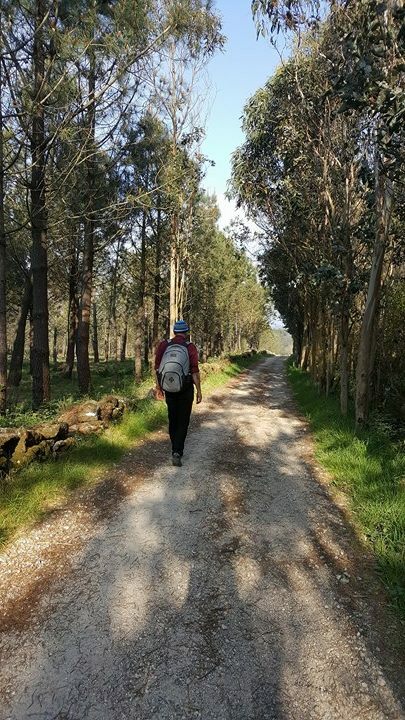 Each one of you has walked steps of this camino with me, through my thoughts. Thankful, to the piligrims that I met along the way, their support, encouragement, words, smiles and energy, helped me when I was in need and tired. 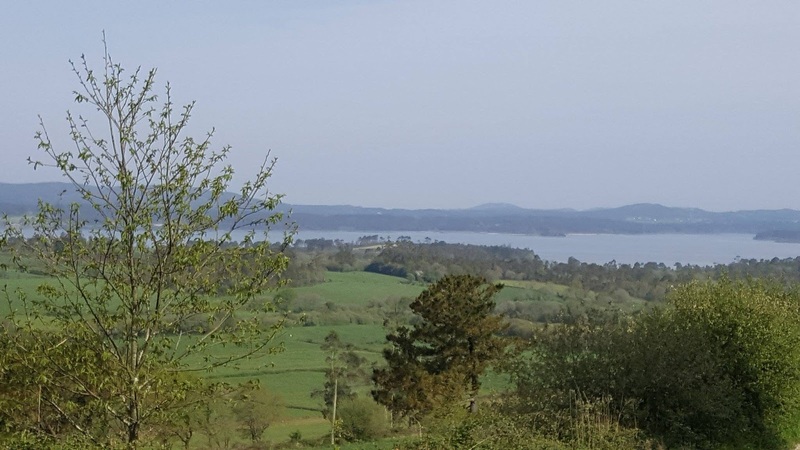 I am thankful to the local people and farmers that have shared their land with me, as I passed by. Thankful to nature for providing me and taking me along the Via de la Plata path. 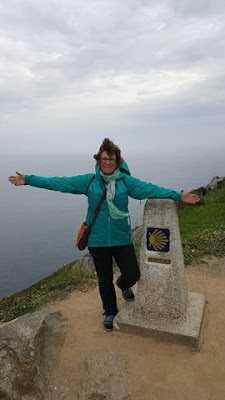 Tomorrow, Friday, I will start another camino, the camino to Finisterre and Muxia. 100 km that will take us, to what was believed the end, the end of earth. 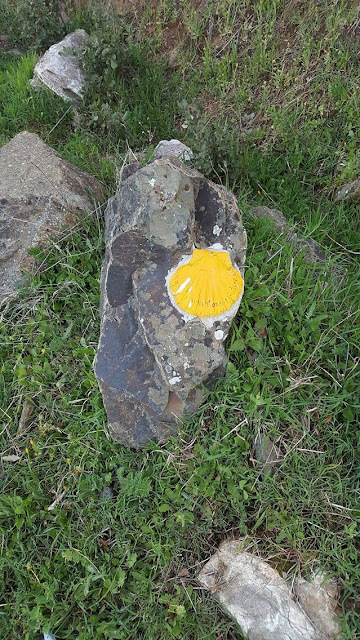 This will be a special symbolic camino for me, that my friend and I will walk and understand, as we will walk.